1. Mix oil and seasonings together in a bowl. 2. 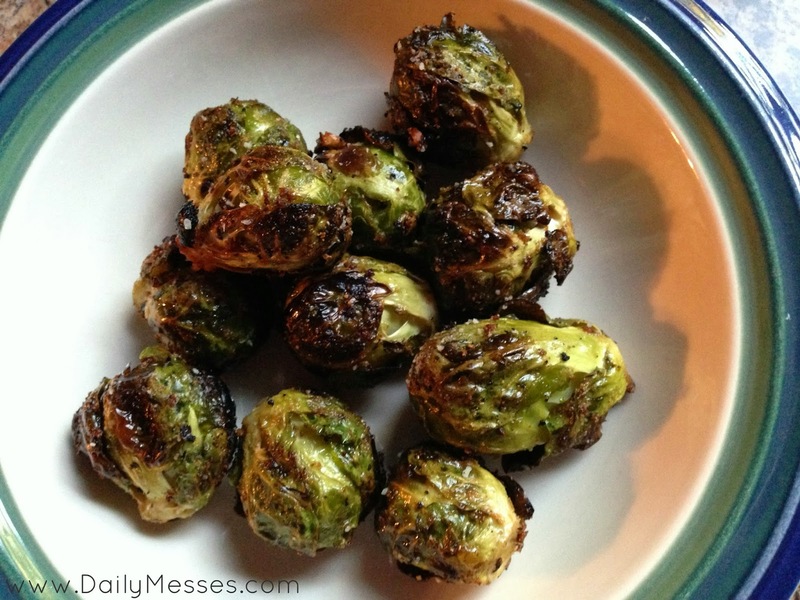 Wash and dry Brussels Sprouts. Take off wilted leaves and trim off the ends. Be careful not to trim too much of the ends off or the leaves will fall off. 3. On the end, in the middle, cut a slit. Make sure you don't cut all the way through. 4. Mix the Brussels Sprouts with the seasoning/oil mix. I like to use a spoon to toss them together. 5. Carefully slide onto skewers. The slit should help them get started, but it does take a little force to slide them on, so be careful not to hurt yourself. DM Tip: Sometimes the seasoning can come off when sliding them on, so I spread any extra seasoning mix on once they are on the skewers. 6. Grill on low heat for about 15 minutes, flipping every 5 minutes. 7. Once they are done grilling, sprinkle with Parmesan cheese and serve!